Strolling in the Scottish Highlands, you might be suddenly captivated by a delicious aroma freshly baked shortbread! Inspired by such memories, real or imagined, this multi-cookie ceramic pan adds the embellishment of a floral design to each luscious piece of shortbread. Pan measures approximately 8" across, and comes with simple recipes and baking instructions. Can also be used to make ornaments of baker's clay or cast paper! Rush delivery not available. 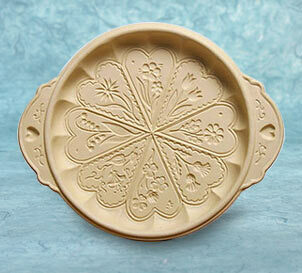 Also available, shortbread pans in thistle, knotwork, shamrock or Celtic medley designs!